If you live in London, New York or Toronto you can find some great things to do this Christmas by visiting I Feel Christmassy. 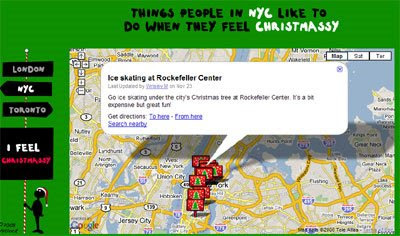 Whether it is going ice skating at the Rockefeller Center in New York or visiting the famous Hamley's toy store in London this Google Maps mashup is a great way of finding and sharing fun things to do at Christmas. 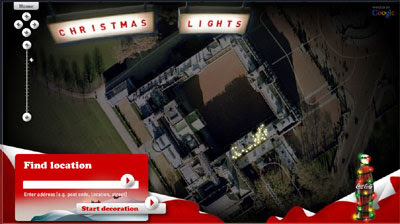 Events and locations are shown on the map with a Christmas tree icon. If you know of a great Christmas event that is missing from the map you can even request an invite and add it to the map. Google have again teamed up with NORAD, the North American Aerospace Defense Command, to bring you the NORAD Santa Tracker. Each year NORAD tracks Santa's gift-delivering journey from the North Pole to your chimney on both Google Maps and Google Earth. The Santa Tracker itself goes live at 6am EST on December 24th. In the meantime the official NORAD Tracks Santa website has a Christmas countdown and a number of Christmas themed games to keep you amused. There are apparently many places named Christmas and Santa Claus in the US. There even some towns named Rudolph, Antlers, Holly, Jolly and yes, even North Pole. This mashup will help you locate all of these places and more! What I'd like to see is a list of towns whose Street View was mapped during Christmastime, so I can see the decorations people put up in their front yards.